After increasing dramatically during the Great Recession, the need for multigenerational house plans shows no signs of slowing down. In fact, a record 60.6 million people lived in multigenerational homes in 2014, according to Pew Institute analysis of census data. The Pew research center is a nonpartisan fact tank that informs the public about issues and attitudes trends shaping American and the world. This means that nearly 20 percent of the U.S. population lives in households consisting of two or more adult generations. There are many reasons for the trend of multigenerational house plans, reflecting both economic realities and cultural preferences. The recession caused many adult children to return home after college, either because they weren’t able to get jobs that would cover rent, or they wanted to save up to buy homes of their own. Significantly, living with parents was the most popular housing option for adults ages 18 to 34 in 2014, according to the Pew Institute. In-law Suite home plans offers separate living spaces for adults. Archival Designs offers stock home plans, for example, the Pepperwood Place and the Tilly which accommodate adult privacy. For many ethnic and immigrant groups, multiple generations of a family living together is a common cultural custom. The country’s growing Asian and Hispanic populations helps contribute to the formation of multigenerational households, too. However, Pew research shows that multigenerational house plans are increasing in popularity with nearly all racial groups. Multigenerational house plans are increasingly popular in cases where grandparents want to help take care of their grandchildren. With this in mind, it allows their children to care for them as they age. This type of arrangement can ease financial burdens as well, with several generations contributing to the mortgage payment and not having to incur the expenses of childcare, retirement housing or professional care-giving environments. 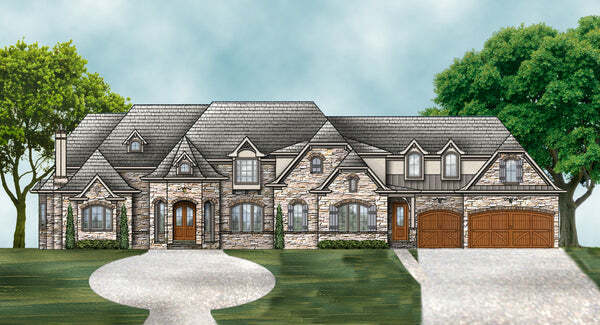 The house plan designer at Archival Designs has implemented the need for American families by offering an entire portfolio of multi-generational home plans. Home builders and remodelers are building and renovating homes to meet the needs of multigenerational households. These designs allow families to live together under one roof with private areas, as well as combined living space. Features of multigenerational home plans can include in-law suites within the main home with separate areas for independent living. These often have kitchenettes and en suite bathrooms, and sometimes private entrances from the street. They frequently include "universal design" features and products, which focus on maximum usability by people of all ages and abilities. Examples include wider hallways, walk-in showers, smooth flooring transitions, and cabinets with pull-out drawers. To learn more about multigenerational house plans call our home plan specialists at 770-831-6363.